(CNN) -- Veteran Manchester United defender Gary Neville has received a surprise England recall for the World Cup tie against Kazakhstan and Andorra next month. 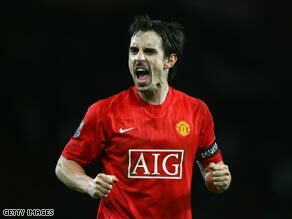 Veteran full-back Gary Neville is recalled to the England squad for June's World Cup quailifiers. The veteran full-back has endured an injury-plagued two years and although he did feature in United's victory at Hull on Sunday, is not expected to start Wednesday's Champions League final against Barcelona. However, England coach Fabio Capello has opted to bring the United captain back into the fold for the first time since he replaced Steve McClaren 18 months ago. The decision means Neville is in line to become the most-capped England full-back of all-time. If he is picked for either match in June, he will equal Kenny Sansom's record for a full-back of 86 caps. Neville will battle with Portsmouth's Glen Johnson for the right to face Kazakhstan in Almaty. All Capello's big-name outfield players have been selected in a 24-man party, with strikers Emile Heskey and Carlton Cole both recovered from the injuries suffered in the friendly win over Slovakia that subsequently kept them out of last month's victory against Ukraine at Wembley. Jermain Defoe returns after a three-match absence, while Theo Walcott is fit for international duty after dislocating his shoulder in training prior to the friendly win over Germany in Berlin last November. It is the goalkeeping department where Capello has most to worry about, although even here he has gone for the tried and tested as first and second choices David James and Ben Foster have been ruled out with shoulder and thumb injuries respectively. West Ham's Robert Green has emerged as first-choice despite winning just two caps, both as a second-half substitute in friendly matches. Blackburn's Paul Robinson, who won the last of his 41 caps in the European Championship qualifying defeat in Russia in October 2007, is recalled along with Scott Carson, who has just been relegated with West Bromich Albion. Strikers: C Cole (West Ham), Crouch (Portsmouth), Defoe (Tottenham), Heskey (Aston Villa), Rooney (Man Utd).